Is this Lady the Most Famous Final Fantasy Tester Ever? Meet Yuko Oshima. She's 23. She's famous. And she's testing Final Fantasy XIII-2. Make that "famous", if you follow Japanese pop music. Oshima is a member of idol group AKB48. And "testing", if you mean appearing in promotional clips. Testing video games is hard, gruelling and time-consuming work! Not that being an idol is a cake walk, but she's super busy with other stuff. Oshima is apparently a Final Fantasy fan, which is why Square Enix asked her to become the "official test player". Square Enix went as far as creating a business card and company employee card for Oshima. It's the first business card she's ever had in her life. As official test player, Oshima will represent the opinions and desires of other FF fans—such as the map in Final Fantasy XIII being hard to read. Oshima, who found FFXIII hard but liked it, will take into account the good things and bad things people said about the game, telling Square Enix what she thinks should be ditched and kept for XIII-2. Oshima will be appearing in commercials leading up to the game's release. Rest easy, Final Fantasy fans! 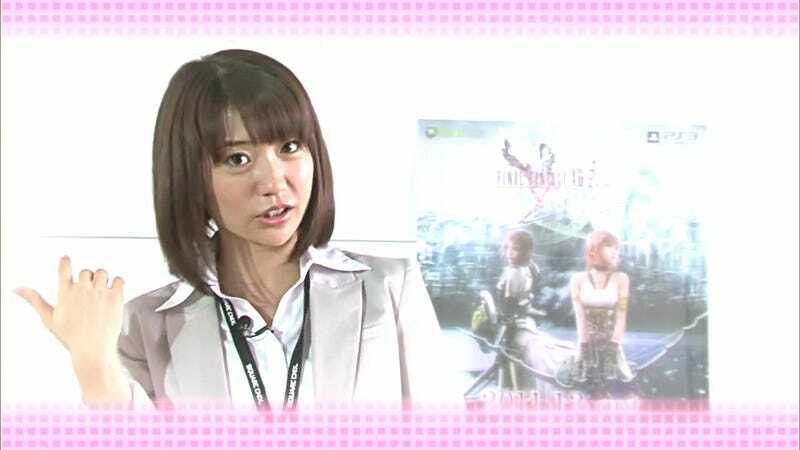 Yuko Oshima is going to save Final Fantasy XIII-2.